Bungee jumping is an activity which involves jumping up off a tall structure with a elastic support. The rope comes bouncing back up until all its energy is disseminated.The tall structure is usually a tower or cliff or even a crane. The best thing about bungee is that it gives you a feeling of free fall. 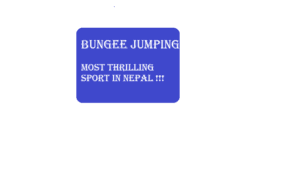 Bungee is one of the significant adventure sport in Nepal. It is quite popular among internal and external tourists. Many tourists from abroad come from abroad countries just for the bungee. There are two existing bungees in Nepal one at Bhotekoshi and another in Pokhara. Another bungee is about to complete in few months in Kushma. The bungee in Kushma is the biggest bungee in Nepal and second biggest bungee in the world after china. Bungee is not a sport for the faint-hearten. Just image falling off a tall structure and virtually getting feeling of free fall. To top it up the bungee of Bhotekoshi gives your feeling of falling in the Bhotekoshi River. You jump from tropical George 160 m high to one of the wildest river of Nepal. You fall straight until you reach near Bhotekoshi River and then you bounce back up. The sport in Bhotekoshi is quite famous and many people have this in their bucket list. Every year many tourists come to Nepal for bungee jumping. Bungee is Bhotekoshi is the first bungee jumping in Nepal. It is hosted by The Last resort. Despite the common myth Bungee is a totally safe sport. No reports of accidents have been recorded in Bhotekoshi Bungee till date. If you are also willing to do bungee then here are few details you would like to know. The person should at least 18 years old and if below must come with a parent in the site. The minimum weight requirement is 40 kg and maximum weight is 100 kg. The participant shouldn’t have any heart and blood pressure issues. Comfortable dress and tight shoes are recommended during the bungee Jumping. In March to May and September to November its open every day except for Monday. While in December to February and June to August, it is open in Sunday, Wednesday, Friday and Saturday only. You should full payment prior to bungee jumping. The total fee for this sport is $108 dollars with lunch and transportation facility. This doesn’t include your video filmed during the bungee. You can get your video another day. Payment can be done via credit cards through email or directly visiting their sales office in Kathmandu. The ongoing bungee project in Kushma is one of the most exciting project happening in Nepal right now. It will be Nepal’s tallest bungee and world’s second tallest bungee. The tallest being Macau Tower in China.The structure is based on the gorge of Kaligandaki River — connects Kushma, the district headquarters of Parbat, with Balewa of Baglung via the 520-meter suspension bridge. It is 224 meters tall making it the tallest bridge in Nepal. While the 160 m high bungee in Bhotekoshi gives you the chill imagine jumping from a 520 meter suspension bridge. The project received investment from different sectors. And the work progress is quite remarkable. The contracting company Paramount Construction claims that work will complete in two months if everything goes smoothly. Prior to its construction the project has already created so much buzz. It is definitely in many People’s wish list. Along with helping in tourism development the project will provide employment to thousands of local directly and indirectly. Kushma is already a tourist destination and is called the city of bridges. With completion of this project the overall development of Kushma and surrounding districts is ensured. According to sources, Netra Parajuli, Nawaraj Poudel, Yubaraj Joshi and Rajan Joshi of Kushma, Raju Karki of Sindhupalchok, Prabhu Bank and a French national have invested Rs 120 million for the project. Prabhu bank only invested Rs 50 million for this project confirmed the bank manager of Prabhu bank in Kushma, Mr. Hemanta Sharma. The person should at least be 18 years old and if below must come with a parent in the site. The minimum weight requirement is 45 kg and maximum weight is 120 kg. The fee for this Bungee is yet to come but it is sure to be a bit higher than existing bungees in Nepal. Looking at the infrastructure in Kushma it is quite commendable that this project has actually come to its final stage. The bungee in Pokhara is Nepal’s first and only tower Bungee. It is located in Pokhara and lets you fall from a tower providing exceptional few of the Himalayas, the hills and rivers. Unlike in Kushma and Bhotekoshi where you jump from bridge you jump from tower. It is only 20 minutes away from lakeside so very convenient from location point of view. The cost for this bungee is $82. If you wish to do bungee but can’t dare to do it in Bhotekoshi then High Ground Bungee is the best choice for you. It is totally safe as it is operated by trained professionals from Europe. And the height is also not very high. The participant should be at least 13 years. The weight should be between 35 and 125 kg. People with heart and blood pressure problem can’t participate. This is just insight of what Nepal has. Nepal has the place for all kind of adventures. Make sure to visit this places before you die. These experience would be crazy and totally thrilling.